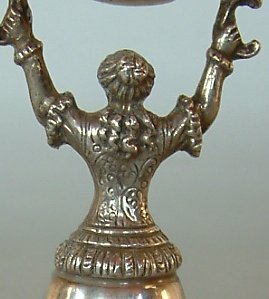 the origins of these cups are 'Jungfraubecher' made in Germany (Nuremberg) around 1565 and in use for all 17th century. 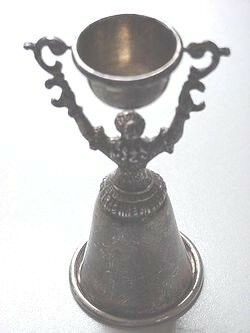 The cup has the look of a young girl with a wide long skirt in the form of a cup supporting over her head a smaller swivelling cup. 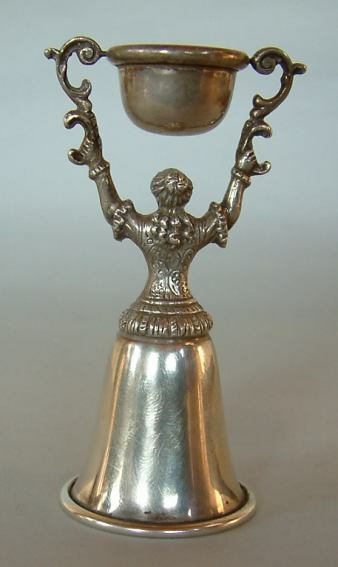 The cup was created for use in wedding's banquets, where the spouse drank wine from the bigger cup and offered his bride to drink from the smaller, avoiding pouring out even a drop of its content. 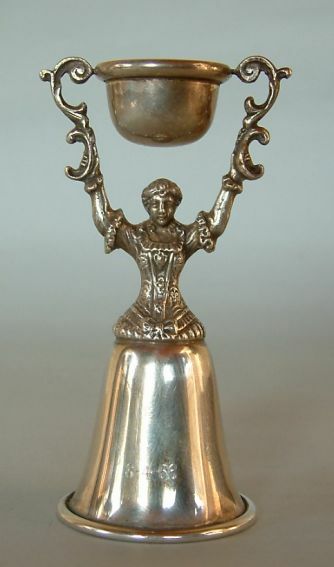 The production of cups in this form was resumed at the end of 19th century (particularly in Germany and Holland) for export to UK and USA, not for wedding but for wager use. 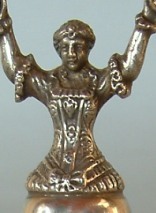 This is a little silver wager cup of recent production (dedication's date is 6-4-66) in the form of a tightly bodied 17th century woman, wearing a full skirt, holding branches from which is suspended a swivelling cup. 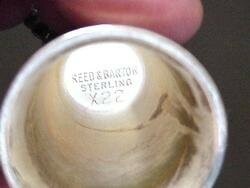 The cup bears Reed & Barton hallmark and was bought by a US dealer through internet (title of item was 'What is it????'). The cup is 3 1/2 in. high (cm. 9) and was bought from an US dealer through the Internet.